I’m not going to rehash the NLDS, I rarely “cover” individual games, and I’m sure you’re sick of it anyway. Rather than talk about the mistakes, issues or decisions, I’ll just say the Nats lost three hard-fought, incredible, memorable one-run games. The Giants beat them, but they were clearly a good team and it really could have gone quite differently. The Nats had arguably the best starting rotation in all of baseball, certainly top 2 or 3. And you know what they say, you can’t have too much pitching! But can you? That is, if you can use your 100% pitching solution to improve your hitting, and still have an 85% pitching solution, is it worthwhile? In a league where pitching is great for many teams, and offense is at a premium, is a great hitter more valuable than a great pitcher? If the Nats believe this to be true, they could make a trade. The most desirable trading chips are Strasburg and Giolito, but I don’t think they’d trade either one. Zimmermann is certainly an interesting option, although he’s an option because his contract ends after 2015, so his value is also reduced. Perhaps they’d once again trade a package of players including A.J. Cole. Or maybe they just stick with the best rotation in baseball. Their hand is not forced here, they have to decide if they want to move someone. 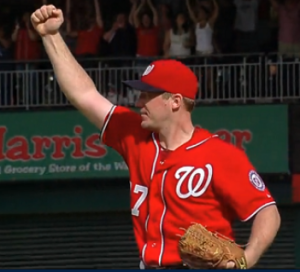 Soriano is gone, the assumption is that Drew Storen is the closer. Are they content with the rest of the bullpen, or do they need to go out and get more? Also, much has been made of the 7th inning of game 4, and rightly so. It would have made sense to pitch Tyler Clippard there. But Williams didn’t bring him in, and I don’t blame him. That’s because he only pitched one 7th inning all season. And that is what I blame on Williams. If he’s worried about Clippard’s reaction to pitching the 7th, to pitching two innings in a crucial situation, then he ought to have tried it out this season. Do the Nats want to stick to their guns on that, or figure out a way to be more comfortable in those situations next postseason? They have to go into 2015 with a plan for that. Who’s the starting 2B going in to next season? 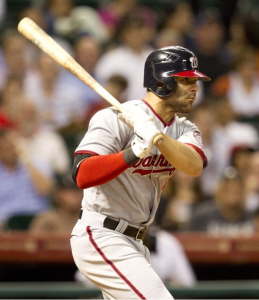 Before we go there, though, what about Ian Desmond – do they want to keep him? He is already the subject of trade rumors, mostly because people assume he’ll get a large free agent contract that just won’t make sense. It will start in his age 30 season, and the list of good shortstops older than that is pretty, well, short. On top of that, he had an atrocious postseason. So did a bunch of other guys, but he struck out in 1/3 of his ABs and is an extremely streaky, low-OBP hitter. He said “the window isn’t closed, but it’s closing” which is more about his career than this team. The Nats have young guys locked up for a while, the team won’t look exactly the same, but could be great with much of this core for another 5 years. Do they see an opportunity to make some moves there, and extend their window? Following an Desi decision, what will they do with Danny Espinosa? He was as great against LHPs (.301/.373/.485) as he was awful against RHPs (.183/.241/.291). The numbers continue a pattern from previous seasons and are so striking, there is consideration to him batting only right handed. It could be a solution that turns him into a full time player, rather than a platoon guy. He’s the best defensive infielder on the team, so he could certainly play SS. There, even if he hits mildly well vs RHPs he could end up being truly valuable. But here’s the problem – they won’t really know if he can successfully stop switch hitting, if they go that route, until next season. And by then the decision will have been made. Maybe they want to find him a platoon partner – but the options on the open market aren’t spectacular. Kelly Johnson, Ramon Santiago and Stephen Drew are all free agent MIs that are better against RHPs, but none are particularly good against them. So they’d probably have to trade for one, if they wanted to go that route. And what of Asdrubal Cabrera? He was slightly better than replacement level overall in 2014 (0.9 WAR), slightly worse with the Nats (-0.3 WAR), but is a free agent. Do they like him enough to try to re-sign him? Alternatively, they could put Anthony Rendon back at 2B, and try to find a third baseman. The free agent class isn’t spectacular, led by Chase Headley, who was pretty good after he got traded to the Yankees, but not great, and a soon-to-be overpaid Pablo Sandoval. Maybe this is where they go to look for the great offensive player for whom they’re willing to trade a pitcher? 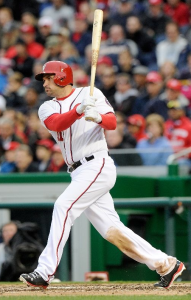 Do they simply want to move Ryan Zimmerman to first base? Or do they like him better in left field? If so, they could consider moving a less-than-impressive in the outfield (and 6’5″) Jayson Werth to first, in turn sending Harper and his ridiculous arm to RF where it fits the positional “standard.” It’s certainly possible that the best defensive alignment between those three looks like that, rather than Harper in LF, Zim at 1B and Werth in RF. Moving an older outfielder to first base would be anything but rare, so they will likely consider that move. They might also decide Zim does play first, but Werth and Harper need to swap positions. The two big names that have options with the teams are Denard Span and Adam LaRoche. It seems highly unlikely that they will try to keep LaRoche, but what about Span? Even though he probably won’t repeat his 2014 performance next year, the $9M option seems like a bargain for him. Do they want him back, or would they prefer some flexibility such as moving Harper to CF and trying to find a power corner outfield bat. With the promise that both Steven Souza and Michael Taylor have shown, I doubt they’ll do that, but you never know. These are probably the biggest questions they have to answer, and although there won’t be wholesale changes, the team will look a bit different next season. There will be more changes than last offseason, as Ryan Zimmerman will be starting in LF or at 1B, and we don’t know who’s starting at 2B. The most valuable starter on the team over the last 5 years could be gone. Their starting SS since 2010 could be gone. Now we get to see how they answer all of these questions.